MTG Revised Savannah Lions. Near Mint/Unplayed. Photos are of the actual card you will receive. Savannah Lions from the Magic: the Gathering Unlimited set in near-mint condition. Magic the Gathering Revised Savannah MTG See Scans For the Condition. Revised Edition 1994 (3ED) - Played - Type: Land - Forest Plains. Condition: Used. Played - Images are scans of the card you will receive. Cards in PLD-SP are in at least Played and are often in Slightly Played condition. PLD-SP condition cards can have a moderate amount of wear from shuffling on the edges and possibly in the middle of the card. 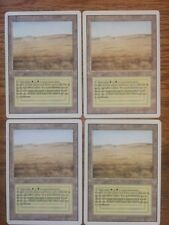 Revised Badlands BGS Quad 8 Graded MTG old school magic Dual Land Reserve list! This item is a BGS Graded 8 Revised Badlands. I have thousands that are not listed. 1x Revised Savannah dual land from magic: the gathering. I would say they are all in light play condition. 1x Savannah from Revised, Very light play, has only been out of a sleeve for the photo, will be shipped in a sleeve and top loader. Heavy Play - Card is visibly aged and played. Without a sleeve, the card will be easily identified. There may be wear through the center or artwork through the face or back of the card. Heavy white spots will be present on the black border or card back. A HP Fbb French Savannah. Cards exhibit light play or grade NRMT/MT or better. Ungraded Single Cards. You'll receive the exact card in photo. Just Graded and received back from BGS this week! Please reach out with any questions ! Thanks. You are bidding on 1x Swords to Plowshares from the Japanese FBB 4th Edition set of Magic the Gathering. The card is in MP condition. The card is in NM condition. The Scan above is the card(s) you will receive. Card is in lightly played to near mint condition. Cards in photos are of actual cards being sold. The card is in SP condition. SAVANNAH #2. Collectors Edition Magic the Gathering. Black Bordered Dual Land CE. This is the only reason I am. MTG X1: Savannah Lions, Unlimited Edition, R, Heavy Play - FREE US SHIPPING! I have no idea why, but hang in there. I have less than 0.5% of my orders that get lost, and if that happens I take care of it one way or another. Up for sale is the Savannah from Revised edition pictured above. Also included in the pictures are an image taken through a jeweler's loop to confirm authenticity. I would grade this card as HP with a slight crease as can be seen in pics. (FOR SINGLE MTG CARDS THAT HAVE NOT BEEN PROFESSIONALLY GRADED). Tons of cool inventory. All cards listed as heavily played are still sleeve playable. may have a minor nick/scratch from handling. Heavily used, may have extensive border whitening. Cards in NM-Mshow basically no wear from shuffling. A NM-M card may have a tiny edge nick and possible a tiny scratch or two but is otherwise unused. The card you will receive is in-. Pictures to reference conditions!! INCLUDED: 3x Revised Savannah Lions Let me know if you have any questions!! All sales are final, no returns as it is near impossible to verify the cards are returned in the same condition they were sent in!! Thank you for your time! The card is in HP condition. 1 x Savannah from revised in nm condition. Pics are of the actual card. (BGS Serial Number: 0009858788. 1) I am not a professional grader therefore I trust in the reputation and opinion of the third-party grading service, which graded this card. No exceptions! Corners: 9.0. Lightly Played - Cards in Lightly Played condition show definite, minor wear. Examples of cards in this grade include cards with mild border wear, minor corner wear, slight scratching, or scuffing/loss of sheen on the front due to play wear. You are bidding on 1x Swords to Plowshares from the Japanese FBB 4th Edition set of Magic the Gathering. The card is in HP condition. There is some inking on the edges. Edition: Alternate 4th Edition. Lightly Played : Cards in Lightly Played condition may have minor border or corner wear, or even just slight scuffs or scratches. There are no major defects. Foils in Lightly Played condition may also have slight fading or signs of wear on the front of the card. 1x Savannah - MP - IE - International Collectors Edition. I'd call it MP condition in deference to the back, but you are the ultimate judge of condition. The card pictured is the exact card you will receive. Looks like mod to lightly played Portuguese 4th edition but please refer to pictures for cards and condition. See my other FBB auctions then request an invoice and check out all at once for combined shipping of $.40 for up to eight cards. You are purchasing Magic The Gathering: SAVANNAH DUAL LAND, Revised - Rare Unplayed. These fees are your responsibility. Magic The Gathering MTG. Light Play To Near Mint LP/NM.